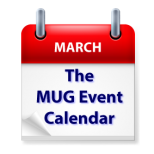 An appearance by Prosoft Engineering at a California group highlight’s this week’s MUG Event Calendar. Presentations on the Apple v. The FBI situation in Arizona, malware and the recent Mac ransomeware in Pennsylvania, and iMovie in Florida fill out this week’s listing, along with Dashboard and Widgets, word processing and the cloud, collaboration options and more. Maine Macintosh Owners & Operators Society – "Mac 201: You Can Run Programs On This Thing, Right?"